Welcome to Citte Center Inc. located at 3312 Wall Ave. in Odgen,UT. 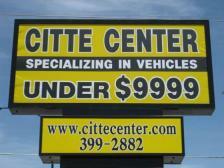 Please call me at 801-399-2882 or 801-559-7755 to arrange a test drive or visit my website www.cittecenter.com to view my complete inventory. I look forward to meeting you!